BAGHDAD — In recent months, Iraq’s northern Kurdish region has seen unprecedented political and economic independence as relations with Baghdad have frayed. But now the region’s own unity appears on the brink of collapse, at a time when it is battling the Islamic State militant group. At the center of the crisis is a political standoff between the dominant Kurdish Democratic Party, or the KDP, and the rival Movement for Change, or Gorran. 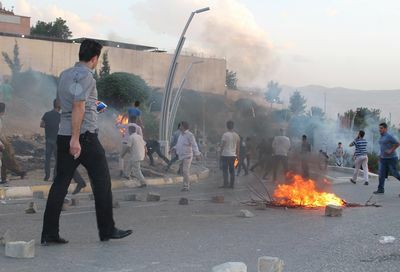 The KDP accuses Gorran of fomenting a week of violent protests in which KDP offices have been attacked and at least five people have been killed. Gorran, in turn, says the KDP has flouted the democratic process to stay in power. The Kurdish leadership also is struggling to maintain internal stability as a crippled economy has delayed salary payments to government employees and discontent is mounting. Meanwhile, the legitimacy of Iraqi Kurdistan’s leadership is also under question, with President Masoud Barzani accused of illegally extending his term after it expired in August. The political turmoil deepened Monday after the speaker of the Kurdish regional parliament, Yousif Mohammed, a member of Gorran, was denied entry into the capital, Irbil, with five other parliament members belonging to the party, the second-biggest bloc in the legislature. Workers at television stations accused of inciting violence were evicted from their offices in Irbil and Dahuk, areas where the KDP dominates, while Facebook was briefly blocked. Kefah Mahmoud Karim, a media adviser to Barzani, said the speaker was prevented from entering Irbil for “his own safety” because he did not condemn the violence. “We couldn’t guarantee that we could control the negative reaction against him,” Karim said. He said Mohammed could return but merely as a member of parliament, because the power-sharing agreement that put Gorran in government no longer stands. “They burned that when they burned our headquarters,” Karim said, adding that he expects a new government to be formed with the Patriotic Union of Kurdistan, or PUK, a long-standing KDP rival. The crisis echoes tensions of two decades ago, when Iraqi Kurdistan split into two administrations, one in Irbil and the other 90 miles southeast in Sulaymaniyah, before conflict erupted between the two sides. There are hopes that the PUK may act as a mediator. However, despite a lack of public statements on the issue, the party seems to side with Gorran, leaving the region politically split. A PUK representative appeared alongside the speaker Monday as he condemned the KDP’s actions. Representatives of Gorran and the PUK said they do not recognize Barzani’s presidency, which was extended after a ruling by the region’s shura council, an advisory body. Underpinning the unrest is economic hardship as government employees have gone months without pay after a dispute with Baghdad about the region’s share of the federal budget. Iraqi Kurdistan has begun exporting its oil through pipelines to Turkey, but the revenue has not covered its monthly expenditures. The tumult also comes as Kurdish forces try to defend a 600-mile-long front line against the Islamic State, which is also known as ISIS or ISIL. However, Kurdish forces have never been completely united, with some units under the command of the KDP and others under PUK control. The political infighting will inevitably have an effect, Stansfield said.